The Nunn Finer Hilda Dressage Bridle combines a contoured elegant Swarovski crystal browband with an eye catching extra wide padded crank flash noseband. This stylish Dressage bridle also combines rolled details in the cheeks and padded throat latch for a truly show stopping bridle. Crafted from beautiful Italian Leather, The Hilda is extremely soft yet durable. This Dressage bridle has a streamlined look and optimal fit with buckles on both sides of the noseband and throat latch. 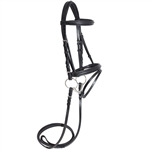 Rolled front leather reins with hand stops are included. The Nunn Finer Hilda Dressage Bridle combines a contoured elegant Swarovski crystal browband with an eye catching extra wide crank flash noseband. 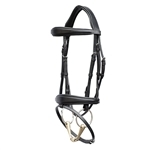 This stylish bridle also combines rolled details in the cheeks and throat latch for a truly show stopping bridle. 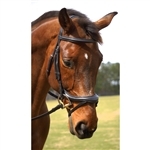 Crafted frombeautiful Italian Leather this bridle is extremely soft yet durable. 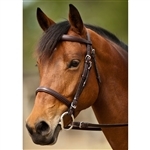 For a streamlined look and optimal fit this bridle has buckles on both sides of the noseband and throat latch. Rolled front leather reins with hand stops are included.